Painter and sculptor. He studied at the Cristóbal Rojas School of Fine and Applied Arts of Caracas, thanks to a scholarship in 1942. When he was young, he spent some time near the Orinoco river being in contact with indigenous traditions; a the age of 15 he did advertising paintings for the cinema, Ciudad Bolívar. He was appointed the director of the School of Fine Arts in Maracaibo in 1947. He traveled to Paris in 1950 with a government grant. Among the most important awards received are Gran Premio Wolf de la Bienal de São Paulo (1963); Premio David Bright Bienal de Venecia (1964) and the Grand Prix National de Sculpture (1995) in Paris. In 1973 the Museum of Modern Art Jesús Soto in Ciudad Bolívar was founded. In the 50... ’s the movement phenomenon, without resorting to engines. 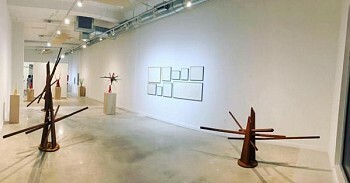 In 1958 he started creating the series Vibraciones, with hanging elements in front of geometric structures that appear to move due to the displacement of the observer. At late 60’s he began its Penetrables, pieces which the observer can go through. 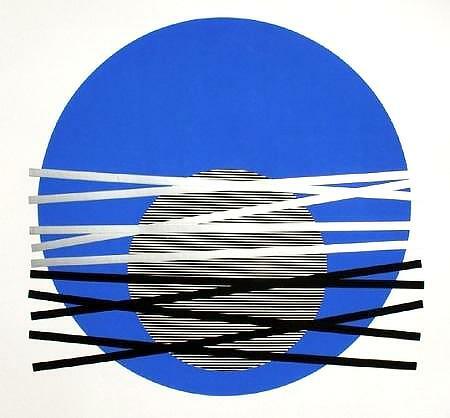 In 1958 he did two kinetic murals for the Venezuelan pavilion at the World Exhibition in Brussels in 1967 and Volumen Suspendido for the Universal Exhibition in Montreal, besides the great relief for the UNESCO building in Paris in 1970 and the Museo de Arte Contemporáneo de Caracas Sofía Imber in 1971. Among his most important shows are: Taller Libre de Arte (Caracas, 1949); Suzanne Michel Galerie (Paris, 1951); Museo of Fine Arts (Caracas, 1957); “Kinetische Bilder-Tableaux cinétiques”, Museum Haus Lange (Krefeld, Germany, 1963); “Werke 1950-1968”, Kunstverein für die Rheinlande und Westfalen (Düsseldorf, Germany, 1968); “Soto: A Retrospective Exhibition”, Solomon R. Guggenheim Museum (New York, 1974); Palacio de Velázquez, Parque del Retiro (Madrid, Spain, 1982); “Retrospektive”, Stiftung für Konkrete Kunst (Reutlingen, Germany, 1997); “Jesús Soto y la filosofía”, Durban Segnini Gallery (Miami, USA, 2001). His works are present in museums and collections including, among others: Solomon R. Guggenheim Museum (New York, USA); Musée d’Árt Moderne de la Ville de Paris (Paris, France), and Museum of Modern Art (New York, USA); Kunstsammlung Dresdner Bank (Frankfurt am Main, Germany); Ella Fontanals-Cisneros Collection (Miami, USA); Daros-Latinamerica Collection (Zurich, Switzerland) and Patricia Phelps de Cisneros Collection (Caracas, Venezuela).